C axes on lathes are typically used for the machining of bar-stock material. Here the graduation of the ERM modular encoder is usually on a diameter that is twice as large as the workpiece to be machined. 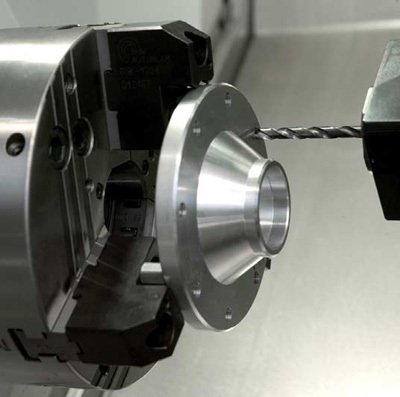 The accuracy and reproducibility of the ERM also achieve sufficient workpiece accuracies for milling operations with lathes (classical C-axis machining). HEIDENHAIN encoders incorporate measuring standards of periodic structures known as graduations. Magnetic encoders use a graduation carrier of magnetizable steel alloy. A write head applies strong local magnetic fields in different directions, so that a graduation consisting of north poles and south poles is formed with a grating period of 400 µm (MAGNODUR process). Due to the short distance of effect of electromagnetic interaction, and the very narrow scanning gaps required, finer magnetic graduations are not practical.